Vietnam country is known as a paradise of delicious foods, which are appeared everywhere in the tourism region. Tourists will have a chance to enjoy the traditional Vietnamese foods and Western foods cooked by the chief. The foods are usually updated to new styles with the imported ingredients. Don’t worry about their quality, they ensure both healthy and robust in flavor with the fresh components: herbs and greens, paired with rice, noodles, seafood, pork, and beef. 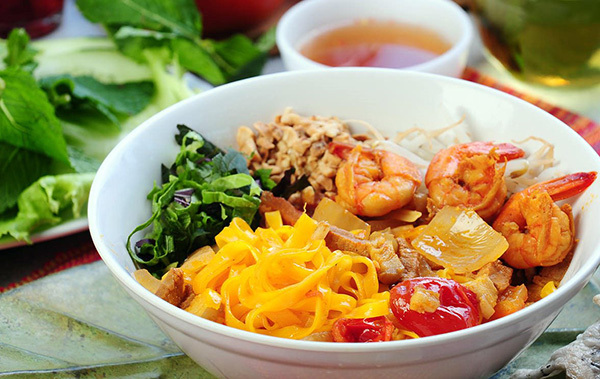 The authentic foods are easy to find on the best Vietnamese Restaurant in Hanoi, Ho Chi Minh, vibrant street markets, and humble-looking restaurants. 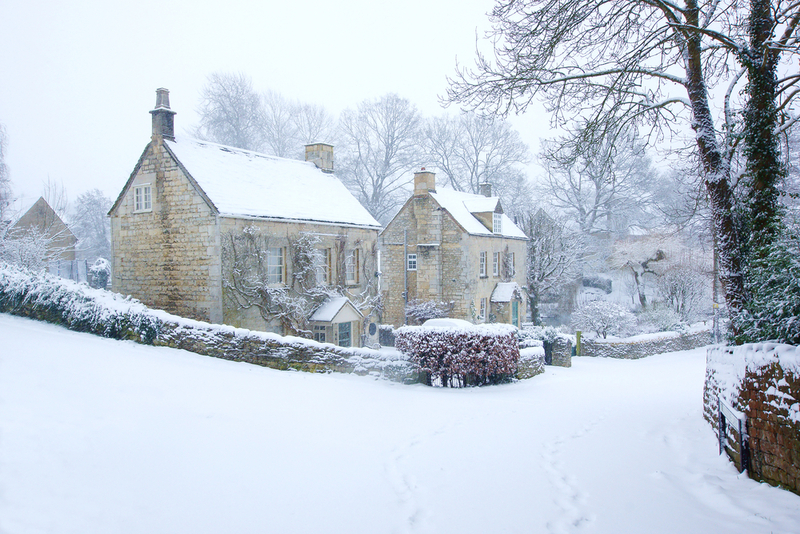 Currently, almost the big restaurants are focusing on the strategies attractive both foreigners and local people. They invite the chief who understand the taste of customers. Besides, tourists are easy to find out the street corner foods to enjoy the good meal. 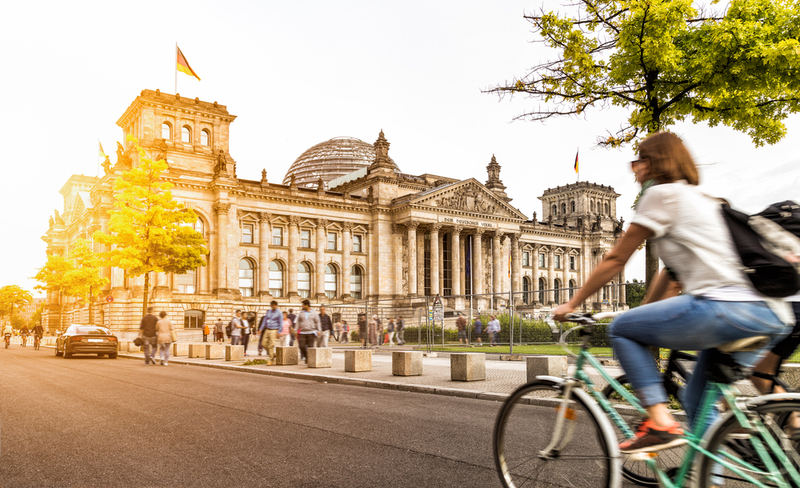 One suggestion for you is to enjoy the food in the street once time to get the typical atmosphere. You also drink beer or rice wine with food served up to dilute the alcohol. Restaurants are focusing on the presentation of food and drink, service, lighting, ambiance, and the overall environment. 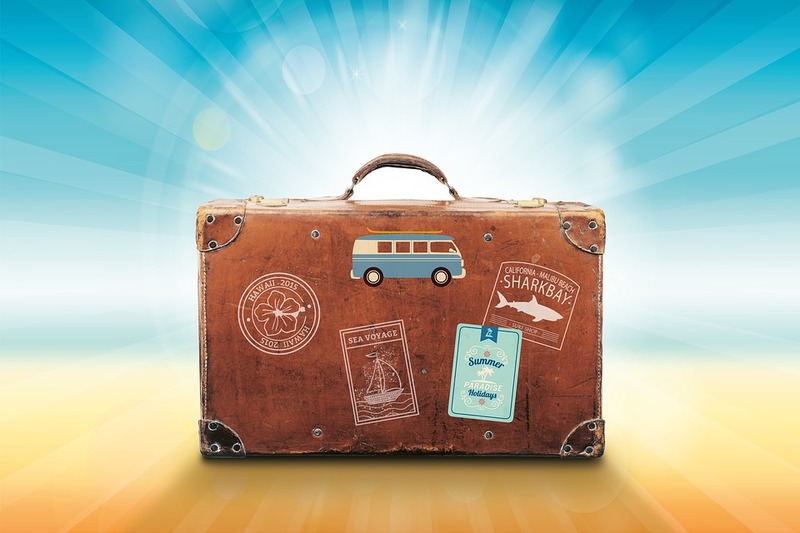 Adapt to your demands, a typical meal includes rice, a meat or seafood dish, a vegetable dish, soup which can easily be customized according to your preference. 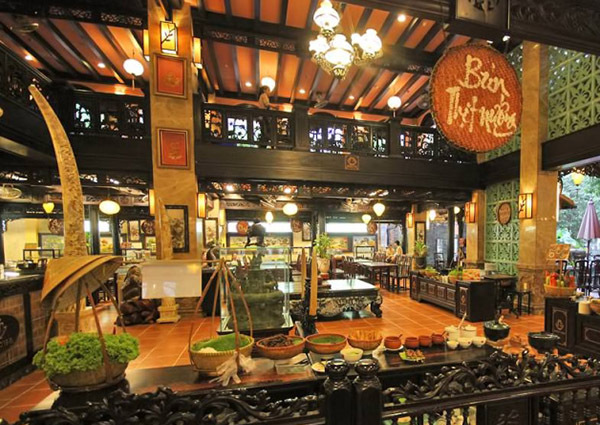 In this article, top authentic foods are the best Vietnamese restaurant in Hanoi, Ho Chi Minh which offer to tourists. Especially, there’s a wide range of Vietnamese dishes only available in certain regions so be sure to try them out during your visit. 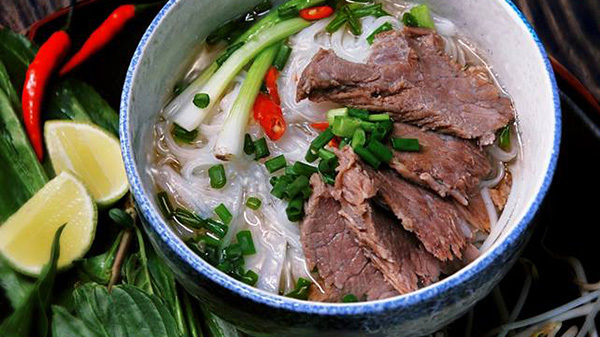 Pho is one of the most popular foods in Vietnam country, to get the best food, the chief has a high skill to combine rice noodles in a flavourful soup. There are many ingredients such as meat and various vegetables, plus a side of fermented fish and chili sauce. A basic bowl contains beef slices, beef meatballs or beef flank, topped with bean sprouts, lime wedges, and fresh herbs such as basil, mint, cilantro, and onions. Depending on which is the restaurant, you choose for more exotic ingredients such as beef tendon, thinly-sliced pig stomach, and flank with cartilage. Typically eaten for breakfast, pho is priced between VND 20,000 and VND 30,000 at a local restaurant or street market in Vietnam. 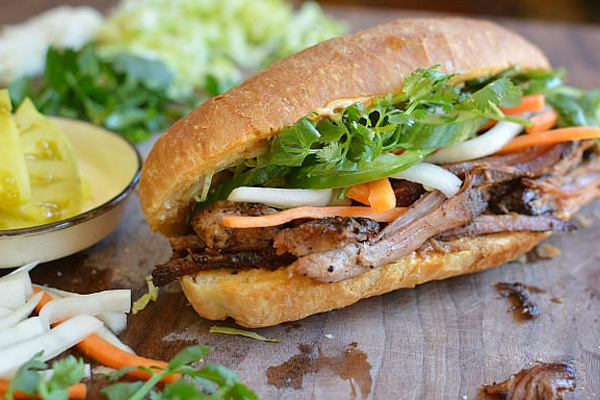 Bread is a unique French-Vietnamese sandwich that’s great for when you’re in need of a quick meal. Priced between VND 15,000 and VND 30,000, it consists of a toasted baguette sandwich, pickled vegetables, pate, butter, soy sauce, cilantro, chilies, and hot peppers. Most banh mi sellers also offer a wide range of meat fillings, including roasted pork belly, fried egg, grilled pork loin, fried fish with turmeric and dill, boiled sausages, Chinese barbecued pork, and poached chicken. Similar to pancake, Banh Xeo is also made of rice flour, coconut milk, and turmeric. The buns of cake are cooked with vermicelli noodles, chicken, pork or beef slices, shrimps, sliced onions, bean sprouts, and mushrooms. Most roadside stalls, local markets, and restaurants sell a platter of banh Xeo for about VND 20,000 to VND 45,000, which usually comes with a side of fresh lettuce or rice papers. You should know how to eat this dish. For distance, a combination the mustard leaf, lettuce leaves or rice papers with lemongrass pork skewers, mint leaves, basil, before dipping in fermented peanut sauce are very good. 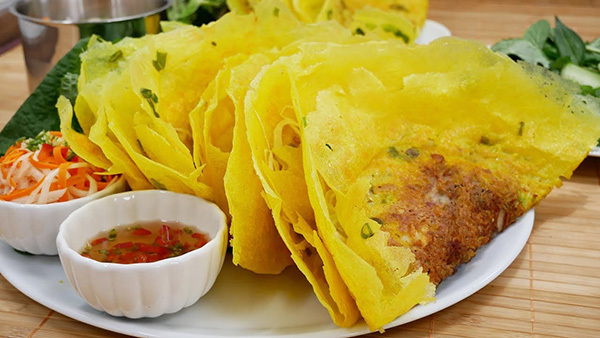 Banh Xeo is essentially a rice-flour pancake filled with pork, prawn and bean sprouts. You should enjoy with a bunch of Vietnamese mint and basil. You get once peace in some rice paper, vegetable and drown out in dipping sauce which is cooked from some variation of lime juice, lemongrass and chili. Honestly, it’s delicious. And it almost felt healthy. Banh Xeo is a typically southern Vietnamese dish so it can be tricky to find them up north. When you go to any big restaurants, you also enjoy the Banh Xeo with reasonable price. 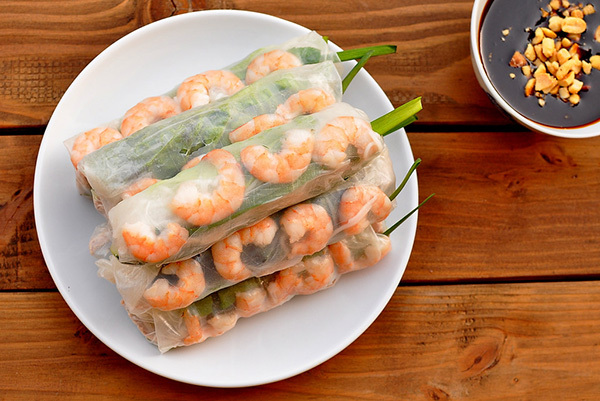 Goi Cuon – Vietnamese fresh spring roll is made from the thin vermicelli noodles, pork slices, shrimp, basil, and lettuce, all tightly wrapped in translucent rice papers. To get the best taste of this dish, Goi Cuon is usually dipped into ground chilies and a dipping sauce with crushed peanuts. This popular food combines with Cha Gio, which is a deep-fried egg roll made with mung bean noodles, minced pork, and various spices. If you travel Danang, you should find out Mi Quang in the most restaurants in Vietnam. It is the special noodle type by the best components like the yellow-colored rice noodles, a hearty mix of bone broth seasoned with fish sauce, black pepper, shallot, and garlic, river shrimp, boiled quails eggs, and roast pork. As with most Vietnamese dishes, a variety of herbs includes basil, peanuts, coriander, lettuce, sliced banana flowers, and sesame rice crackers are mixed in this dish. Another food in the best Vietnamese restaurant in Hanoi, Ho Chi Minh is Bun Thit Nuong. 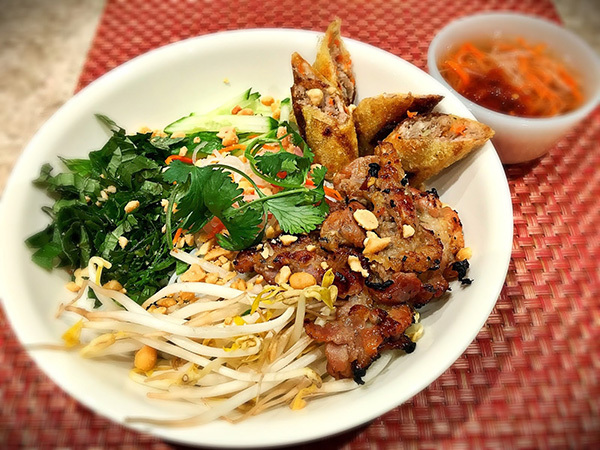 This dish made from vermicelli rice noodles, chopped lettuce, sliced cucumber, bean, pickled daikon, chopped peanuts, and topped with grilled pork shoulder. Unlike most noodle dishes, the dipping sauce mixed meat is separated with noodles. 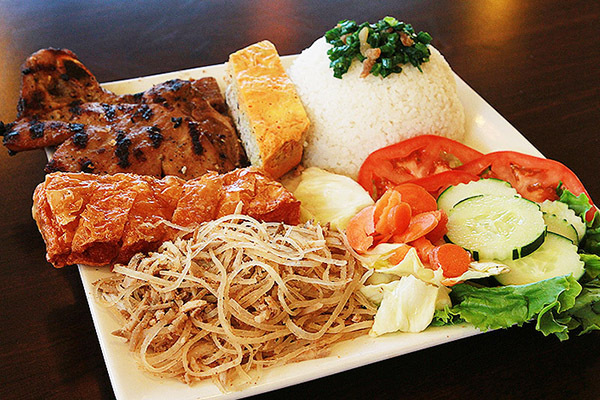 There are many types of Bun Thit Nuong with other meats like Cha Gio, pig, beef and so on. Another popular food is Banh Cuon which you must try one time. In the morning, you can get the breakfast with a rolled cake which combines meat of chicken, shrimp, or pork, minced wood ear mushroom, onions, steamed bean sprouts that’s wrapped in a steamed rice flour sheet. As a result, its overall taste is surprisingly mild despite the savory ingredients. For added flavor, you need to mix the Banh Cuon into the dipping sauce. As the taste of Banh Cuon is very suitable with the favorite of tourists so there are numerous roadside vendors providing this dish. Com tam is called ‘broken rice’ in Vietnamese and is traditionally served with fried egg, diced green onions, and a variety of meats. 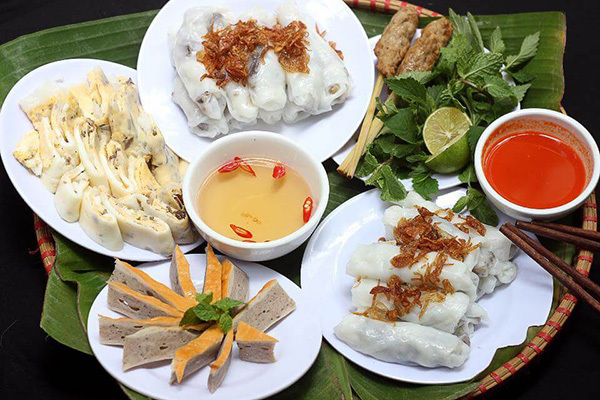 This food is famous for the highlands such as Sapa, Mai Chau,… You can enjoy on the breakfast with relatively inexpensive price in the street markets and roadside food about VND 20,000 per piece. Toppings options include barbecued pork chop, shredded pork skin, and steamed pork and egg patty. Com tam also comes with pickled vegetables, cucumber slices, and Vietnamese dipping sauce. Belong to the list of the best Vietnamese restaurant in Hanoi, Ho Chi Minh, Duong’s Restaurant offers the fantastic local dishes for customers. You will taste so many the best local food in Vietnam. Moreover, if you join in the cooking class, you will get their skills in the kitchen. Duong restaurant is a traditional food court where can bring the regional specialties from across Vietnam, all cooked fresh to order. Maybe you don’t know, the chief – Hoang Duong in this restaurant who is voted in the Top Master Chef Vietnam. If you go to Ho Chi Minh, Duong restaurant will appear in Saigon, you completely search for the place to enjoy the meal. Highway 4 was once the go-to restaurant for tasty infused rice wine and country-style Vietnamese cuisine since December 2000. After some years, take the challenges in the market, the restaurant chain went into decline. 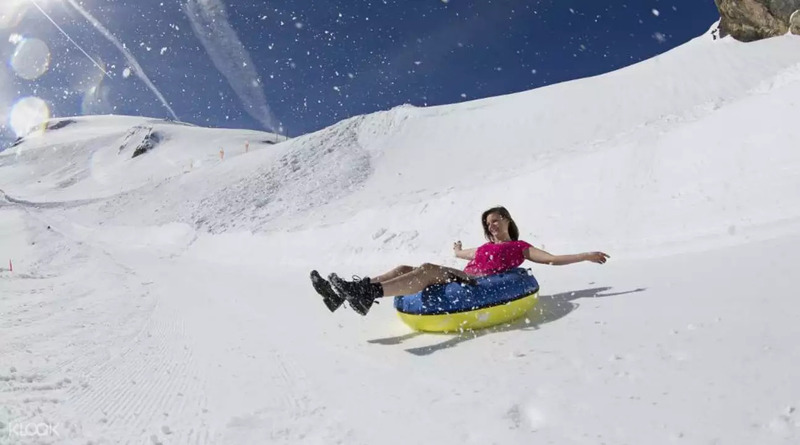 Until 2015, the owners decided to change Highway 4, and push on all those things that made them popular in the first place. Quan An Ngon is known as a paradise of with their street food concept that has put a twist on Vietnamese cuisine. The decoration of this restaurant is applied to the modern trend. Maybe you listen to two names of restaurants Cau Go and Chim Sao by their good reputations, come in at equal fourth. Besides, Madame Hien and Green Tangerine are two restaurants popular with the tourist market. Another restaurant in Ho Chi Minh is Quan Bui which is famous for honors the home-kitchen cooking style of Vietnamese to the next level. The restaurant located on the normal street, which constructs on four-flour chic building with a rooftop garden. Thus, the kitchen is almost always busy. Don’t worry about the quality of foods as the chief tends to choose the fresh and healthy the materials to make the best meals. You shouldn’t miss the stir-fried beef with coconut shoots or stir-fried pumpkin flowers with garlic. Made-fresh-to-order food cannot get any fresher than this. 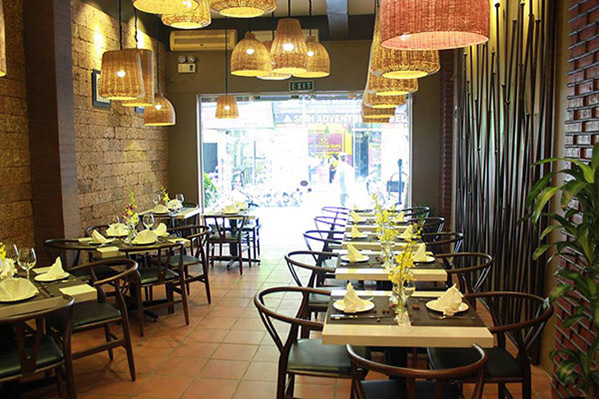 In August 2008, Hoa Tuc is the first contemporary Vietnamese restaurant in Saigon. Hoa Tuc not only famous for the providing perfect meal for customers also having the professional staffs. All Vietnamese dishes are prepared meticulously and beautifully. Hoa Tuc tends to build the “fusion” concept with a creative menu but it must ensure no difference too much from tradition. Guests will fall in love with the BBQ showed the Saigon-style pork and taro fried spring rolls. Hoa Tuc is a lovely hidden gem tucked away in the stylish courtyard where once was Saigon’s old opium refinery and just a block from the Saigon Opera House. 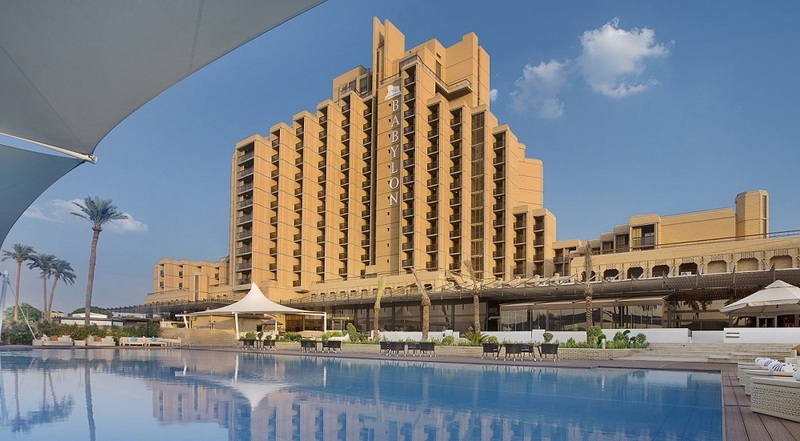 Moreover, customers can enjoy the lush greenery and creepers all around, the Paris design and its secluded al fresco dining section and charming air-conditioned indoor dining room.